John Harvey Kellogg, his brother Will Keith and all their fourteen other brothers and sisters ate hot pancakes with bacon fat and molasses most days for breakfast. Mrs Kellogg got up early, stoked the fire, and had the pancakes cooking before anyone came down to eat. The Kelloggs lived in a log cabin in the Michigan forest, then in a small house in the small town of Battle Creek, Michigan. Life was tough and not much fun. The children were expected to earn their living in their father’s broom factory as soon as they were able. Mr and Mrs Kellogg belonged to a strict religious group called the Seventh Day Adventists, who believed that the Sabbath was on a Saturday. They also believed in health reform, which meant using water as a cure for illnesses, and eating a simple diet with no tea, coffee, alcohol, tobacco, spices, and also, they eventually decided, no meat. Battle Creek was the Adventist headquarters; here the group set up a medical boarding-house where people could be treated for their illnesses by following Adventist teaching on diet and behaviour. But the Health Reform Institute was still very small when, in 1876, John Harvey Kellogg, now a young doctor, took over. He ran it for the next sixty-five years. Dr John had plenty of ideas about diet. As a medical student in New York he had a barrel of apples and a barrel of a special biscuit called Graham Crackers in his room. Every morning he ate seven Graham Crackers and two apples, helped out by one coconut a week and occasionally potatoes and oatmeal. With this diet he put on seventeen pounds and felt fit. 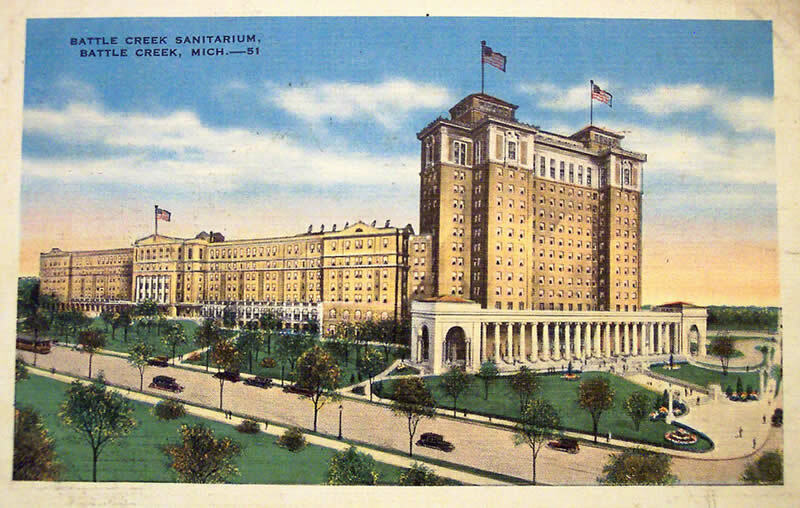 The Battle Creek Sanitarium became very popular, even world-famous. (“The word is Sanatorium” it was pointed out. “I don’t care” replied Dr John, who had probably made a spelling mistake. Sanatorium means a rest home for wounded soldiers; Sanitarium will mean something different’) Overweight ladies and their overworried businessmen husbands came to rest, exercise, diet and breathe fresh air. Dr John was a marvellous host, and there was plenty of occupation: games, lectures, concerts. The very ill came to ‘The San’ as well, and, when possible, poor people who could not afford to pay were given free attention. John Kellogg worked extraordinarily hard. He didn’t believe in holidays, so neither could his staff. He wrote over eighty books, and hundreds of articles about his various medical and dietary beliefs. He travelled overseas, developed a new type of stitching for surgical use, and at the peak of the Sanitarium’s popularity was looking after twelve hundred guests at a time. People a hundred years ago ate very badly by today’s standards. Since the beginning of time, man’s problem has been to get enough to eat – and it still is for much of the world’s population. In the United States there was plenty of food, but people always seemed to bolt it down in a hurry – gobble, gulp and go. Out west, the diet was far too monotonous: coffee, hog and hominy (a maize porridge) for every meal. In big cities the rich overate. It would take twelve hours’ hard physical labour to use up the energy produced by a meal which included two or three kinds of meat, fish and game, plus spices and pickles. But more and more people were now living sedentary lives; their stomachs just could not cope with such huge meals. A stay at the Battle Creek Sanitarium made patients think about the importance of a good diet, probably for the first time in their lives. Dr John Kellogg believed in a proper diet, not drugs, to cure illness. Meat, alcohol and smoking were strictly forbidden at Battle Creek Sanitarium, because of Adventist teaching. But the vegetarian meals served in the dining-room were very monotonous, and some patients left because they did not like the food. Others would sneak off to the Red Onion, a cafe in town where they could get steak and chops. From the beginning, Dr John Kellogg experimented in the kitchens with new, appetizing ways of preparing vegetarian foods. He invented Granola, which looked like toasted breadcrumbs, and he also invented peanut butter. The cooking of cereals converted some of the starch in the grains to dextrin and so made them easier to digest. He used the things vegetarians are allowed to eat, such as nuts, grain and vegetables, to invent foods that tasted like the things they were not allowed to eat. Protose was like beef, Nuttose like veal, and Caramel Cereal tasted like coffee. Ex-patients began to ask for supplies of the Sanitarium health foods, so Dr Kellogg set up small companies to manufacture his inventions, and sent his foods to his customers by mail order. In the middle of Dr John’s experimenting, an inventor called Henry D. Perky made a machine for shredding wheat, and sold the resulting litde pillow-shaped product as Shredded Wheat. People liked it. Then a businessman called Charles W. Post came to the Sanitarium for a cure, but spent most of his time in the kitchens and laboratories. He thought that Dr John Kellogg’s cereal substitute for coffee was a magnificent idea for making money, and offered to go into business with Kellogg, who angrily refused. The good name of the Sanitarium should not be involved in selling something commercially, and certainly not in advertising. But Post knew that because of the San, the name Battle Creek meant healthy living and good diet to Americans. So he set up a factory in Battle Creek, and started to manufacture his own cereal substitute for coffee, called Postum. Post advertised heavily and cleverly. ‘Do you suffer from coffee headaches ? Take Postum.’ ‘Postum Makes Red Blood’. Soon he invented Grape-Nuts, a hard, chewy cereal food. Grape-Nuts was advertised as being beneficial for the appendix, malaria, loose teeth, and the brain. Post’s profits went up so fast he was a multi-millionaire within seven years. 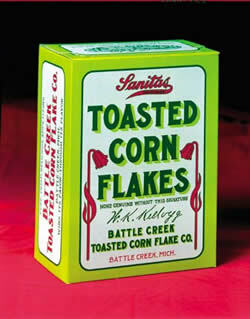 Dr John and Will Keith Kellogg made the first pre-cooked flaked cereal in 1894. They were looking for a digestible substitute for bread and had no idea they were inventing a breakfast food – the phrase did not even exist. Dr John was experimenting with wheat, which he boiled for varying lengths of time, and then pushed through rollers. Will scraped the sticky dough off the rollers with a knife. Nothing useful could be done with this mess. One batch of boiled wheat got left for several days; no one had time to do anything with it. In the end the brothers decided to put it through the rollers, although it was very mouldy, to see what would happen. Out came large thin flakes, each grain of wheat forming one flake. The flakes were baked in the oven and emerged crisp and tasty. After more experimenting, the Kelloggs found out how to leave the boiled wheat long enough to produce flakes, without the wheat becoming mouldy. Even though they were tough and rather tasteless, the wheat flakes were instantly popular with the Sanitarium patients. The secret of how to make them leaked out; soon there were dozens of manufacturers copying the recipe. Battle Creek suffered a breakfast-food rush. Post’s success, and the various Kellogg inventions, brought hundreds of hopeful money-makers into the town to try their luck at making a breakfast food in a box. There were dozens of recipes, using wheat, corn, rice, oats – roasting and boiling them, squeezing, rolling or cutting them up. One sack of wheat from the farmer could be transformed into hundreds of cartons filled with flakes and puffs, and a large profit – or so everyone hoped. Temporary factories sprang up. Investors talked busily on street corners. But the craze didn’t last long, and most of the companies failed. The makers of Cero-Fruito, Tryabita, Tryachewa, Nutrita, My Food, Per-fo, Malt-Ho and Maple-Flakes gave up their dreams of instant fortunes from breakfast foods. Will Keith Kellogg could see all the Sanitarium food inventions being taken over and developed by other people. He was determined not to let this happen to the best invention of them all, corn flakes. A method for making corn flakes had been worked out about four years after the wheat flakes. At the age of forty-six, when he already thought himself an old man, Will Keith Kellogg began a new career. He left the Sanitarium, collected together money to start a factory, paid Dr John a large amount for his share in the corn-flake invention, and set up in Battle Creek the Toasted Corn Flake Company. All his savings went into the scheme. The Doctor heartily disapproved. Quarrelling soon broke out between the brothers and law cases started over who had the right to do what: who could use the name Kellogg, for example, in the manufacture of breakfast foods. Dr John had always refused to use the family name on any of the Sanitarium products. Now, when Will Keith began to use it, he decided he would too. After all, who was the famous Kellogg ? When Will Keith Kellogg wrote out his first cheque for a million dollars he said he had never wanted or expected to be rich, but other people had made him rich by trying to push him around. He just dug in his toes and became determined to win. The packets of corn flakes rolled out of Will Keith’s factory in Battle Creek in ever increasing numbers. The taste of corn flakes had been improved by adding malt, sugar and salt for flavour. Will Keith argued that since there were more well people than sick people, corn flakes must be advertised as good to eat, and not treated just as a health food. To fight off imitators, every packet had this message, in red ink: The original bears this signature – W. K. Kellogg. Will Keith was determined people should not get muddled over who was producing corn flakes. Like Post, with Postum, he spent huge amounts on advertising, using especially the new invention, radio. Free samples of Toasted Corn Flakes were given away to millions of housewives. Breakfast-food manufacturers were some of the first to concentrate on children: if children wanted Kellogg’s Corn Flakes, then their mothers would probably buy them. Give-away presents were included in each packet: cut-outs, sets of cards, models. Kellogg’s developed other cereal products: for example, All Bran and Rice Krispies. W.K. became known as the ‘Cornflake King’, and his products were made and sold around the world. Fifty years after the company began, the factories at Battle Creek alone produced six million packets of cereals a day, and a million of these were corn flakes. When he was seventy years old, Will Keith Kellogg started a third career: giving away his money. A foundation was set up with most of the Kellogg Corn Flake fortune. Its especial interest was, and still is, helping needy children. The foundation also gives money to hospitals, schools and research centres. To the end of his life Will Keith hated all publicity. He was a rather difficult, shy, simple old man, very different from his popular, bossy, enthusiastic brother. Dr John Kellogg and his wife had no children of their own, but one way or another they collected forty-two boys and girls and brought them up in their home. Will Keith Kellogg argued so often with his son that the young man left the company, and the old man found he had no member of his family to carry on the business. Will Keith Kellogg did not achieve his final ambition: to live longer than Dr John. Both brothers died when they were ninety-one, but the imperious old Dr John managed three more months of his ninety-second year than Will Keith.